The sledding Siberian Husky sisters Loup & Lumi at Jefferson Lake a few days ago. You can see the video of their exploits on Youtube. Nice shot of two beautiful dogs and I really like the pov here. love the clarity of the two dogs. great lighting and vignette. 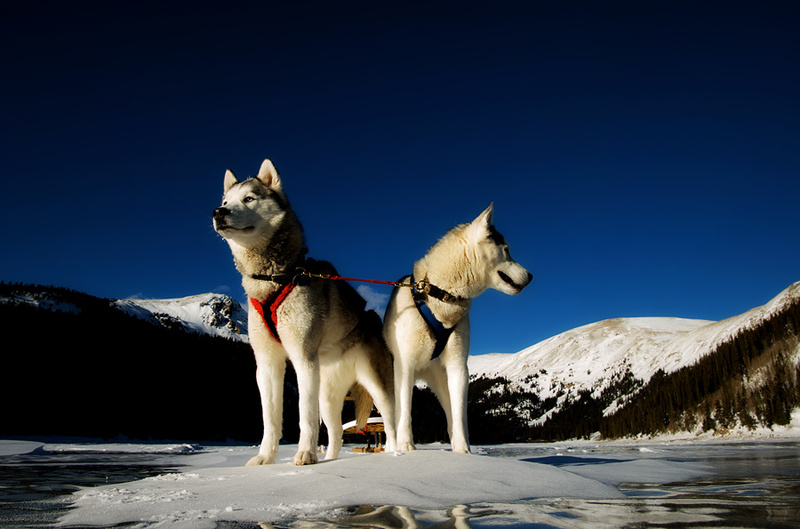 I like the pov here and those beautiful dogs against the snow, ice and blue sky. Beautiful light also. The low POV definitely the right choice. Lovely texture in the fur of these lovely huskies. Beautiful richness of color. Gorgeous shot. good point of view, enhances the beauty of animals, well integrated into their environment .. I love it. What Cuties! Love the angle and colors in the photo! Such a beautiful shot. I love your low perspective – it's what really makes it work. Great angle. Love the blues. I like the way the dogs ignore you. Looks as if you were down in the water when you captured this. this is even better than the one before, just becouse of the position you choose. Positively heroic! Why can't I get my dog to pose like this? Excellent colors and composition… very, very beautiful pic.